There are some movies that are just awful, lacking any redeemable qualities to be appreciated at any level. Skyline, released as the latest incarnation of the Alien invasion movie sub-genre, is certainly one of the truest examples I can remember of utter mediocrity. Having past the first five minutes of the movie, Skyline had already lost me. The film begins midway in the story only to take us back, as many other movies do, to the events that led to the moment we first witnessed. It turns out that it was important for a movie lacking any credible emotional or rational substance to try to establish the setting or back-story for lifeless characters we end up not caring about. It could have actually worked better if the film-makers had just made a movie about Aliens killing humans we don’t know the names of. As it turns out, I was relieved that the Aliens were clearly winning and that the characters presented to us were being eliminated swiftly and without much opposition. Movies such as these do not fail because they lack the funding (Skyline was made for a quite modest $ 10 million) to support the usual grandeur that such a genre tends to require, they fail because they try too hard to be grand and accomplish many things, failing miserably in every level. 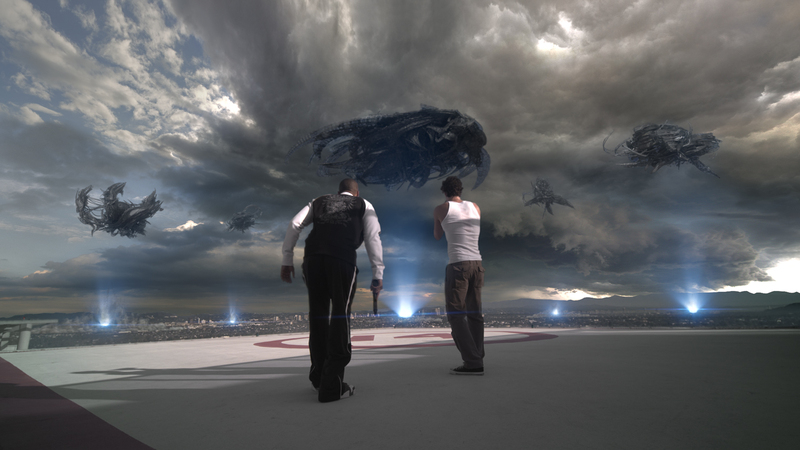 In addition, we have seen that Sci-fi films about aliens or UFOs can be made for relatively small budgets and accomplish good results, which was the case of the original Alien, District 9, 12 Monkeys and many other great films.